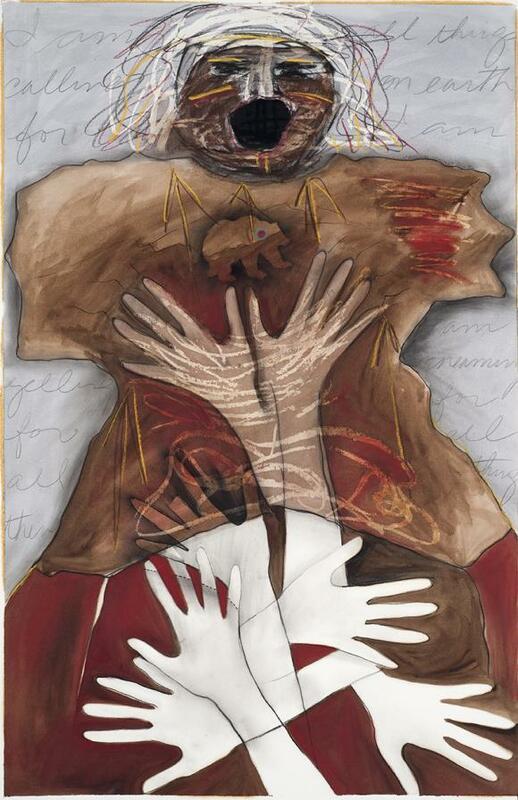 Joane Cardinal-Schubert, My Mother’s Vision: The Warshirt Series - I am Yelling for All Things on Earth - I am Screaming!, 1986. Photo: MacKenzie Art Gallery. The MacKenzie Art Gallery in Regina, in the Saskatchewan province of Canada, has been gifted more than one thousand works of art by contemporary Indigenous and Inuit artists. Collectors Thomas Druyan and Alice Ladner, who are based in Alberta, Canada, pledged to donate the works over a three-year period. The workswhich are part of the Kampelmacher Memorial Collection of Indigenous Art, named in honor of Druyan’s grandparents Wolf and Sala Kampelmacherare by artists from across Canada, including from the Mi’kmaw Nation and all four regions of Inuit Nunangat. 220 of the works are from the exhibition “Across the Turtle’s Back: The Kampelmacher Memorial Collection of Indigenous Art,” which was staged at the museum in 2016. Among the artists represented in the collection are Allen Angeconeb, Shuvinai Ashoona, Joane Cardinal-Schubert, Blake Debassige, Robert Houle, Helen Kalvak, Daphne Odjig, Pitalousie Saila, and Oviloo Tunnillie.